Local pick up preferred; buyer pays shipping. Dimensions: Each wall is 7' tall, 4' wide and about 2-1/2 to 3' deep at the bottom where the brace/brackets stick out. The 2 walls latch together with 2 locks/keys to keep them from separating. When connected the full wall is 8' across. The walls are very sturdy, yet relatively lightweight. We built them to withstand guests leaning on/against them. Because of their size, they are a little awkward to move with one person, but it can be done. 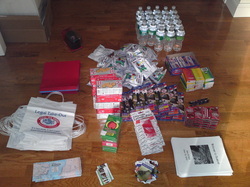 They are light enough that I can pick up each one separately by myself. We moved them using a truck with the rear seats folded down. We also have some fabric you can use to cover them to keep them from getting dusty before the big day. I can give you clear instructions on how to remove the frames & redo the fabric/change the photos if you need help. You just need a screwdriver (or better yet, power screwdriver!) to remove the large frames or the "wall" part from the white frame. Please let me know if you have any questions. If you are interested, but don't want to store them, we can negotiate a rental. 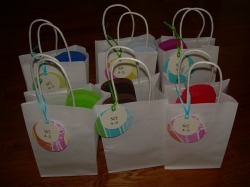 6 pairs of flip-flops in assorted colors in white bags with size tags. Bought from Michael's. All size small (4-5). The white bags they are in are also from Michael's. I will also include: extra size tags I already made, the paper I used to make the tags (if you need to make more), the template I used to make the size tags, and can give you exact directions, and information on what I purchased from where for how much if you need more! If you just want the flip-flops or just want the "extras," make me an offer--totally willing to split them up if preferred. 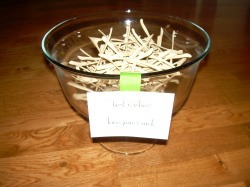 We used this bowl to put the fans in. I added a little sign that said, "to keep you cool," but that can be removed. We had 54 fans in the bowl and there was room for more. 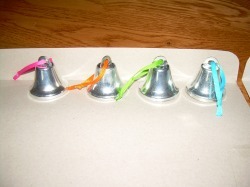 We had our guests ring these tiny silver bells as we exited the church. It sounded beautiful! I got these at Joann's. I cut off the tag that came on them and replaced it with a 6" length of 1/4" grosgrain ribbon (bought at Joann's for $1/spool) in orange, teal, lime green & hot pink. Obviously the ribbon could be replaced with another color very easily. 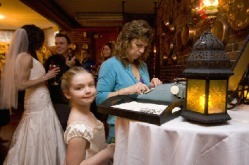 We used a vintage typewriter for our guestbook. We used these boxes for the blank & completed pages. 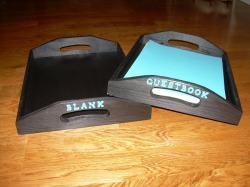 They are wooden, painted black, with wooden letters painted teal glued on the front to spell "BLANK" and "GUESTBOOK." Each box is perfectly sized for 8-1/2x11" typing paper. We used this to hold custom handkerchiefs we made for our guests. 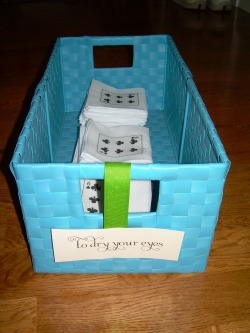 I added a little sign that says "to dry your eyes" and we had them on a table at the ceremony. 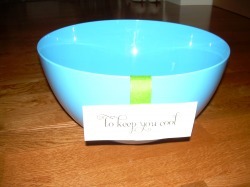 The sign is just attachedwith a grosgrain ribbon, so it can be easily removed without damaging the basket. 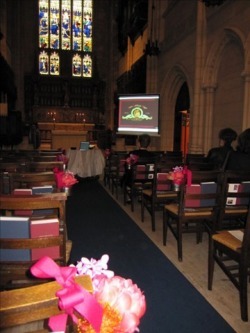 These mini tin buckets were filled with flowers and hung by ribbon off the pew ends in the chapel. I also have the pre-cut grosgrain ribbon available if interested. It is cranberry colored. 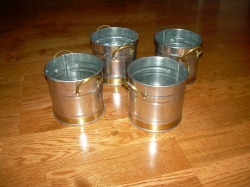 The mini buckets are 3.75" in diameter, and 3.5" tall. They are galvantized tin with gold colored handles & a gold colored band around the bottom of each one. 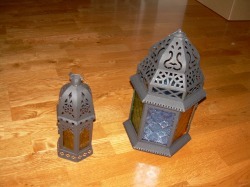 We used these Moroccan lanterns as centerpieces and to decorate around the restaurant. They each have a LED votive inside with plenty of life left in them. 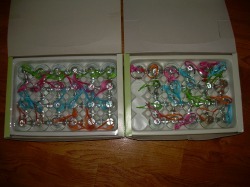 There are a couple larger ones with multicolored glass, while the smaller ones have a single color (amber, blue, etc). The picture just shows 2 styles, but there are actually 3-4 variations. I will include a 14th lantern with 2 broken panes of glass, incase you need to replace any of the other panes, as well as any extra LED votives I purchased. Lantern by our guestbook at the reception. 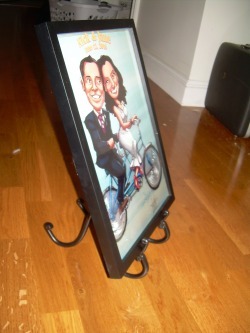 This holder is for a larger (8x10" or 11x14") frame or sign. 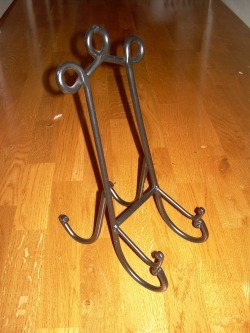 Black wrought-iron style. 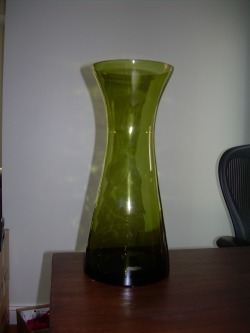 This tall, green vase was used for a beautiful bouquet of tropical flowers and placed at the bar at the restaurant during our reception. 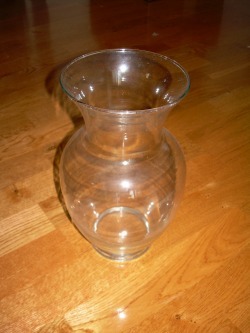 I'll have to measure, but I think it's about 18" tall, and maybe about 6" in diameter. 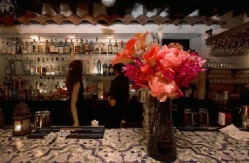 Photo below of how it looked at our reception. Glass trifle bowl used to hold the wishbones. I *am* willing to split up the contents of the bags & sell them individually, but I'd prefer to just sell someone everything I have (and I can let you know where I got everything if you need extras), so I probably won't start splitting up the lot unless no one is interested.